Choosing a dress form can be tricky. While their price range varies greatly, they also come in some different types that work considerably differently from one another. Also, there are hundreds of them out there on the market, and it’s hard to tell which are the best ones for your needs. And this is where we come in as usual. Use our research to find the best sewing dress forms, as we have also reviewed them below so that you can simply pick the one that fits the bill perfectly for you. This is arguably the best dress form you will find on the market. It’s not as popular as some of the cheap dress forms out there, but it sure is made of a much better quality material, high quality fine linen to be specific. So unlike a cheap dress form where customers often complaint of durability issues in just a few months, this one from Roxy Display Inc. should hold up well over a much longer period of time. But the quality of the material isn’t the only factor you want to consider when looking for the best dress form to buy. However, this dress form comes in a great size, which is probably as accurate as the sizing for any dress form can get. Ranging from design students to fashion designers to the hobby sewers, this dress form has managed to meet the needs of just about everyone. 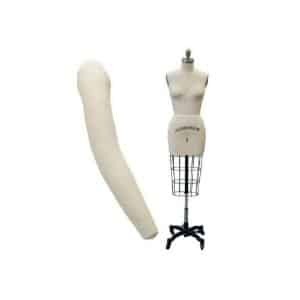 Regardless of whether you plan to use it for draping on or testing garments, it will turn out to be just as useful and functional. Talking about functionality, it also comes with collapsible shoulder, which takes so much challenge out of your usual tailoring. You wouldn’t need to unzip the garment when slipping it off, which you have to when using some of the cheaper dress forms. The height of the dress form is adjustable as well, and you can adjust the height by simply pushing the foot pedal. The arm is included for free, and the surface is pin-able as well. Finally, it also looks beautiful, so it will work great for display as well. Regardless of the sewing machine you’re using, not getting the size of your garment right can end up spoiling your sewing project. And this dress form offered by Roxy Display Inc. would not only help you ensure you’re using the correct measurements for your garments, but also for draping and other things that would eliminate a lot of trial and error from your projects. It’s also very durable and looks great, so using it for displaying your projects would work pretty well too. This is the best adjustable dress form with a great overall customer rating. While it’s far from as expensive as a professional adjustable dress, it still works great for its intended purpose. The adjustable dials it comes with work really well and are very easy to use. You can easily change the measurements by simply moving them in the direction of your measurement. 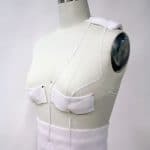 Something that helps it stand out as a dressmaker form adjustable, however, is its soft covering. Often times, the more affordably priced dressmaker forms adjustable come with a covering that’s not as easy to pin into, and the covering also doesn’t hold up well over time. However, this adjustable dress form’s covering is both easy to pin into and durable, thanks to being made of a higher quality material. It’s also impressively sturdy for an adjustable dress form. As some of the adjustable dress form reviews form customers mention, it’s also surprisingly lightweight, so you would be able to move it around very easily. The assembly is pretty straightforward as well, and a customer mentioned of being able to put it together in as less as 20 minutes. The instruction sheet this product comes with is also very detailed, and explains everything you would need to know to use for all your needs. Needless to say, it would make the pinning and marking extremely accurate, and you would also be able to make it work just as well even for plus size ladies by simply putting some piece of garment over it (which is easy to do as well). It simply isn’t the kind of cheap adjustable Craigslist dress form you may have heard about. However, it also isn’t as expensive as a professional adjustable sew dress form, but you still get a great level of adjustability with it. It being a durable product ensures that the adjustable dials would continue working well for a long time to come, and would also be able to handle the heavier garments which some other products just cannot. If you plan to work on more than just some basic sewing projects, we think it would be one of the important sewing essentials for you. As you can tell from the hundreds of dress form reviews this product has received from customers, it’s one of the best-selling dress forms on the market. But does that make it any good? Well, if you’re looking for a budget dress form that does what it’s supposed to do without spending hundreds of dollars, then this SINGER dress form certainly won’t disappoint. 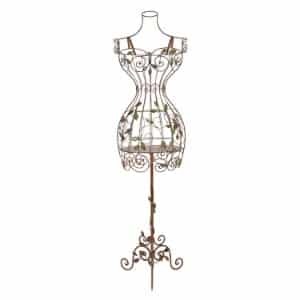 Despite its low price, it’s one of the best adjustable dress forms you would come across. It’s fully adjustable and would allow you to make all kinds of pattern adjustments and alterations, and make sure you always work with perfectly accurate measurements. This is all thanks to the fact that it comes with as many as 13 different adjustments that allow adjusting for not only the body, but also for necklines and other specific areas just as easily too. It’s also as customizable as a general dress form can get, as you can set it at specific height levels based on your needs. It comes with a hem guide that allows you to conveniently use pins and markings on it. The pin cushion along with the key holder makes managing all the pins you use very convenient and easy. Finally, you would find that some customers are leaving a negative review for this product, but that’s only because they couldn’t figure out how to make it work. The instructions it comes with are confusing and vague, which makes it difficult to expand this dress form and use it properly. We really like the kind of value it brings to the table as a surprisingly affordable dress form. It can also be a fairly good alternative to those customized dress forms that often come with a hefty price tag. If you’re building a great sewing room on a budget, then this would make a great component of your room. Sure, you may need some read up on a sewing help guide a bit to learn to use it the right way, but you would really be pleased with how functional it turns out to be for you once you do. This is the best-selling dress form on the market, and for a reason. As the most helpful dress form review from a customer for this product says, if you don’t want to shell out hundreds of dollars on an adjustable dress form but still get the kind of functionality and adjustability a high-end dress form comes with, then the Dritz Sew You Dress Form may very well turn out to be your best bet. Most customers that posted dressmaker form reviews for this product have no hesitation in saying that it’s the best dress form for sewing on a budget. One of the dress form reviews even said that the price seemed too good to be true to them, but it indeed turned out to be that good. Despite being cheap, the Dritz Sew You Dress is far from limited in terms of its adjustability. Even if you’re 6 feet tall, you would have no problem in adjusting it to your height. This is definitely something worth noting, as such adjustability is super hard to come by in this price range. There are many dials for all-round adjustments, and they move very smoothly. Similarly, unlike many dress forms in this price range, this one comes with a base that’s durable and sturdy, and a customer mentioned that they put their super heavy wedding dress on it and it did stand up to it really well. After all, there’s a reason even professional sewers have been all praise for it; it simply offers an amazing value at this price point. Well, as you can tell based on our review above, the Dritz Sew Your Dress is the best dress form for home sewers that don’t want to spend a bomb on a high-end dress form. This is exactly what many dress form reviews from customers mention too. It’s sturdy enough to hold all kinds of garments, regardless of how heavy of a sewing fabric they have been made of. If you will be using this dress form to take measurements for your quilting projects, then your quilting cutting mats and even your quilting rulers & ruler racks will thank you for the accurate measurements it would help you get which would make their job easier as well. First things first, this metallic dress form is arguably the most wonderful, elegant dress form you will find on the market. It’s different from the rest of the products we reviewed in the sense that it’s designed to have a great decorative touch to it, as against the others that try to be more functional than anything else. However, this makes it a great dress form if you’re looking to use it for display. It will certainly look great if you put your sewing work on this dress form, attracting considerably more interest from potential customers than it otherwise would if you’re a professional sewer that makes and sells your work. That said, however, it’s certainly not that it can’t be used for other things too which a dress form is typically used for. 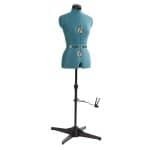 Sure, you might have to find a workaround for it, but once you do, you will have a gorgeous dress form that not only works great for displaying your work but is also functional enough to help you with your everyday tailoring and sewing work. A simple way to do this is to cover it with a loose cami slip before putting any garments on it. This is something especially important to do when you’re trying to put something that’s made of a fabric like the barkcloth fabric or even a knit fabric. But once you cover it using a cami slip, you will be golden. You will then be able to use it for draping exactly the same way as you would use any other perfectly functional dress form. Similarly, if you also want to put earrings and bracelets, you can use the trap door for them. The base would also allow you to have shoes on it. As for pants, you can easily hang them on the wires. So it’s easy to see how it could work as a “complete” dress form while having a great decorative edge. This amazing combination of functionality and elegance is one of the reason this dress form cheap has managed to get almost universally positive reviews. As far as the value to price ratio is concerned, then this Deco dress form might as well give a run to some of those popular project runway dress forms, which are actually way more expensive. 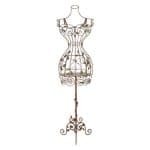 Although it’s not a pin-able dress form like the others we reviewed above – due to being made of metal – it would work just as well for draping garments. However, it’s the decorative look and feel it comes with where it really shines. So you would not only have a dress form that you could drape clothes on after covering it with some cloth, but it would also look so pretty that you would be able to use it for all kinds of display purposes. How We Chose the Top Dress Form in Our List? First of all, we don’t review or recommend any used dressmaker form. This is because there can be durability issues with them, and they may not function as good as a new one. That said, the overall bang for buck is one of the most important factors we consider. For anyone looking to buy dress forms, this is a crucial factor as they can range from as low as about $50 to as high as over $1000. So if you’re looking to buy a dress form, do take the price into consideration, but make sure it’s not the ONLY factor you consider. There are also other important factors that we consider, including the overall functionality and for adjustable dress forms, the adjustability. The more the adjustable levels, the better it would be for your needs and the easier it would make the usual draping and measuring tasks. The supplier is also important when buying a dress form, since many online stores that are not very reliable sell them too. If you’re wondering where to buy a dress form, then Amazon is the only place we could safely recommend so far. If we find more based on our research at a later point, we will mention that here. Just like most sewing products, dress forms come in a few different types as well. One of the most popular type of them is adjustable dress forms. They are adjustable in the sense that they come with dials that you can move to adjust the height, waist, and other areas of the dress form. This gives you a lot of flexibility with respect to the measurements and the types or sizes of clothes you can measure on them. It also makes the usual draping work considerably easier. Another type of dress form is non-adjustable dress form, but it’s made of a quality fabric and is pin-able. This means the fabric of the dress form allows you to put pins into it when you’re taking measurements, which makes it very easy for you to get accurate measurements for your sewing projects. 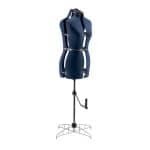 Some of them also come with a collapsible arm, which makes draping and taking measurements for tailoring considerably easier, and you could also take the garment off without unzipping it. As you could tell, this would save you a lot of time if you try many different garments on a dress form as a part of your sewing projects. Then there are also the ones that are made of plastic or metal. They are usually only good as a display piece, but some do allow a workaround so that you can use them for other things too. You do have to take some special care when putting garments made of batik quilting fabric or another soft quilting fabric when using a metal dress form. On a side note, the same goes for when using a mechanical sewing machine too, as if you’re not careful with the way you’re handling softer fabrics when using it, the fabric might get damaged in some way. If softer fabrics is what you usually use for your sewing projects and your work doesn’t call for a lot of power or heavy duty use, then even an overlocker sewing machine might make a great choice. Why You Need the Best Dress Form for Sewing? As you probably already know, getting the measurements right is an essential part of a sewing project. And simply put, the best dress form can go a long way in helping you get extremely accurate measurements. Similarly, it would also turn out to be very useful for draping garments, which can otherwise be pretty time-consuming and sometimes even frustrating. Draping without a dress form would be like using a sewing machine for quilting for your sewing projects. It would work but it wouldn’t be an ideal approach to your sewing projects, as you would need a good Brother sewing machine or a reliable Juki sewing machine for it that’s not specifically designed for quilting. Finally, going with the best dress form would also be a great way for displaying your work, which many sewers like to do. Of course, it’s an important part of the job for professional sewers as they need to display their work for selling it.